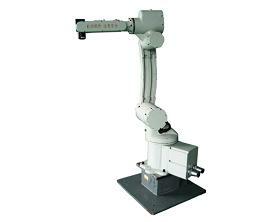 6 DOF industrial robotic arm is a typical industrial robot that is used in automatic operation of pick and place, installation, welding, painting, etc. The new serial industrial robot combines the motion control technology together with advanced educational concept and fulfills both the industrial needs as well as the education and research needs in motion planning and industrial system design. The robot uses 6-joint in serial design. Each joint uses absolute encoder and high precision harmonic gearbox to ensure the accuracy. Camera, pneumatic tools and some other interfaces are preserved at the end effecter for user to extend the robot for other usage. The robot is controlled by the newly developed VME bus controller which integrates PC, image processing technology, logic control and motion control to achieve high speed, high accuracy control of the robot. Based on VME bus open architecture high performance industrial motion controller. VC++ software and CoDeSys realtime control software. Visual display for teaching and training makes programming the robot easier. Detailed operation manual and lab manual. In serial structure, absolute encoder and high precision harmonic gear box. Module design, simple and compact. High payload, high speed, large work space. HMI (Human Machine Interface), integrates the display function for PLC programming. Motion Control Function Block, integrates the motion control and PLC. ENI (Engineering Interface) Server, interface for auto-manufacturing. Web Server, integrates network control function. Motion Planning Based on Intelligent Control System and Software. Remote Network Control, Multi Robot Coordination.